The Labouchere system (or the "Cancellation system") is an efficient enough negative progression betting system based on developing numeric lines that define how the player bets in case of loss or win. The player composes a line of numbers, either subsequent or random (from 1-2-3-4-5-6 to 1-2-2-4-5-7, etc. ), short or long, depending on the player's bankroll and on how much he or she wishes to win. The sum total of numbers in the line defines the amount of winnings in the game. Every number in a line stands for a certain amount of units (or chips). The player is supposed to bet two outside numbers of the line (the first one and the second one). For example, if the line is 1-2-2-4-5-7, the first bet will make 8 with 1 and 7 added. Cross out the two winning numbers and bet the two outside numbers that remain in the line (in our example it is 2+5, which makes 7). With the next win, add numbers 2 and 4 to make your bet. If all numbers are crossed, you will have a so called 'coup' - completed game. You may now proceed with another numeric line. In case the bet loses, sum total of the lost bet must be added to the end of the line. In our example it would be 8 (1+7). The line would now look like this: 1-2-2-4-5-7-8. If the first bet wins, but the second (2+5) loses, the line will look like 2-2-4-5-7, and so on. The players may also apply the reverse Labouchere system and add winning bets instead of losing to the line. And vice-versa, the lost bets are crossed out from the line. 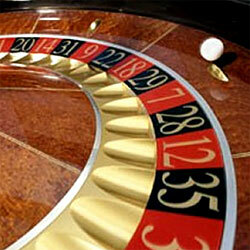 You may add your winnings until you actually exceed the table limit of the casino. The line that is crossed out loses and you may start another one. What makes the Labouchere system advantageous is that the player using it doesn't have to win more than half of all his or her bets to get profit. In fact, the Labouchere system is considered by many even more efficient than some of more popular systems like the Martingale betting system. Besides, the Labouchere system works with outside even-money bets, which makes the chances of winning your bet equal. Unfortunately, when you apply the Cancellation system, there is still risk of striking a bad patch and losing every bet you make. This may cause significant losses. But compared to the Martingale system, it is still safer as the size of bets doesn't grow that fast as when they are doubled. Besides, this system can't beat the house edge of the casino. That's why it is usually recommended to play European roulette with a single zero slot reducing the house edge to 2.7% (compared to about 5.3% in American roulette).